SupportPac MA01 was written by Paul Clarke back in June 1995. It was one of the first SupportPacs for MQ as you can tell by its number. Paul wrote it because the amqsput, amqsget and amqsbcg samples didn’t give him the flexibility he wanted. It became a very handy tool in the pocket of many an MQ administrator over the years. 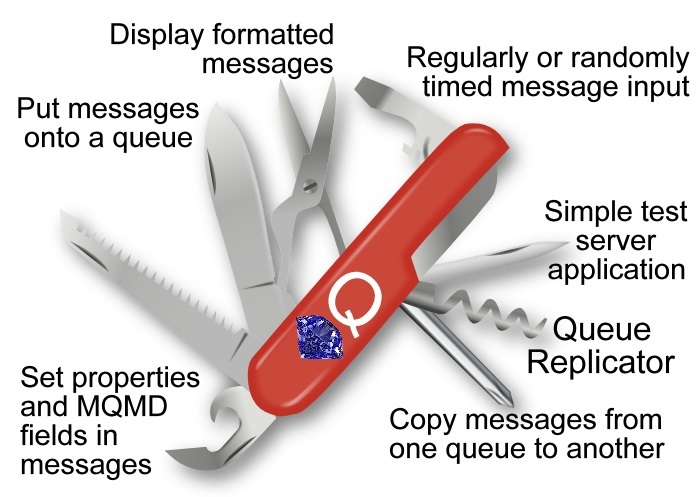 When Paul left IBM to form MQGem Software, the MA01 SupportPac was discontinued, and it’s source code put on GitHub for anyone who wanted to build it and run it themselves. However, many MQ users don’t want the complication and expense of looking after home-built tools, and would prefer a fully supported product. As such, a few of our customers have asked whether we would be willing to continue to maintain and enhance the Q program, and so here it is. Q will load the MQ libraries from the place identified by setmqenv. To make it easier to find the option you are looking for since the Q program does have a lot of flags!. Formatters for JSON, EDIFACT, CSV and FIX message formats have been added. This will display text such as &gt; as the character ‘>’. The Q program is now 64-bit across all platforms. The special message format string which starts with the ‘#’ character previously had a 40 character limit. This has been lifted. MQRO_PASS_CORREL_ID has been added to the confirm options on the -n flag as -n[passc]. The prompt menu used by -xc to set various client connection channel settings such as TLS and exits has been updated to only request valid exits for a client channel, and to use a more modern CipherSpec by default. The use of truncation on an MQGET has been made safer by requiring the user explicitly select MQGMO_ACCEPT_TRUNCATED_MESSAGE when using the -=> flag by using the optional ‘t‘ flag, to give -=t<length>. The Commit interval (-p) flag has been extended to also take an optional commit interval after which an incomplete transaction, that is one that has not reached the requested total number of messages, will be committed anyway. The subscribe call created with the -S flag can be additionally configured to use MQSO_SET_CORREL_ID by using the -gc:CorrelId flag. Some minor flags have been renamed to improve usability and consistency. These are listed in full in the User Guide. The majority of the flags are exactly the same as they were in the Support Pac. Even if you don’t intend to purchase a licence, you may find value in downloading the user guide. At long last we have a manual for Q! As we said above, the parameters are not absolutely identical to the SupportPac, but the majority are the same, and the vast majority of the manual is still applicable to the SupportPac. You may well discover features you never knew that Q had. Read more about the new product, and download a copy, from the Q Web Page. If you would like to try out MQGem’s Q program before deciding whether to buy then send an email to support@mqgem.com and a 1-month trial licence will be sent to you.